For other uses, see Basil (disambiguation). Basil (UK: /ˈbæzəl/, US: /ˈbeɪzəl/; Ocimum basilicum), also called great basil or Saint-Joseph’s-wort, is a culinary herb of the family Lamiaceae (mints). There are many varieties of basil, as well as several related species or hybrids also called basil. The type used commonly as a flavor is typically called sweet basil (or Genovese basil), as opposed to Thai basil (O. basilicum var. thyrsiflora), lemon basil (O. × citriodorum), and holy basil (Ocimum tenuiflorum). While most common varieties of basil are treated as annuals, some are perennial in warm, tropical climates, including holy basil and a cultivar known as “African blue basil“. The name “basil” comes from Latin, basilius, and Greek βασιλικόν φυτόν (basilikón phutón), “royal/kingly plant”, possibly because the plant was believed to have been used in production of royal perfumes. The Latin name has been confused with basilisk, as it was supposed to be an antidote to the basilisk’s venom. 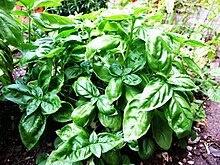 Most basils are cultivars of sweet basil. Basil is most commonly used fresh in recipes. In general, it is added at the last moment, as cooking quickly destroys the flavor. The fresh herb can be kept for a short time in plastic bags in the refrigerator, or for a longer period in the freezer, after being blanched quickly in boiling water. The dried herb also loses most of its flavor, and what little flavor remains tastes very different, with a weak coumarin flavor, like hay. The most commonly used Mediterranean basil cultivars are “Genovese”, “Purple Ruffles”, “Mammoth”, “Cinnamon”, “Lemon”, “Globe”, and “African Blue“. The Chinese also use fresh or dried basils in soups and other foods. In Taiwan, people add fresh basil leaves to thick soups. They also eat fried chicken with deep-fried basil leaves. Basil (most commonly Thai basil) is commonly steeped in cream or milk to create an interesting flavor in ice cream or chocolates (such as truffles). The leaves are not the only part of basil used in culinary applications, the flower buds have a more subtle flavor and they are edible. When soaked in water, the seeds of several basil varieties become gelatinous, and are used in Asian drinks and desserts such as faluda, sharbat-e-rihan, or hột é. Several other basils, including some other Ocimum species, are grown in many regions of Asia. Most of the Asian basils have a clove-like flavor that is, in general, stronger than the Mediterranean basils. The most notable is the holy basil or tulsi, a revered home-grown plant in India and Nepal. Lemon basil has a strong lemony smell and flavor very different from those of other varieties because it contains a chemical called citral. It is widely used in Indonesia, where it is called kemangi, served raw together with raw cabbage, green beans, and cucumber as an accompaniment to fried fish or duck. Its flowers, when broken up, are a zesty salad condiment. The various basils have such different scents because the herb has a number of different essential oils in different proportions for various cultivars. The essential oil from European basil contains high concentrations of linalool and methyl chavicol (estragole), in a ratio of about 3:1. Other constituents include: 1,8-cineole, eugenol, and myrcene, among others. The clove scent of sweet basil is derived from eugenol. The aroma profile of basil includes 1,8-cineole and methyl eugenol. Most culinary and ornamental basils are cultivars of the species Ocimum basilicum, but other species are also grown and there are many hybrids between species. Traditionally a green plant, some varieties, such as ‘Purple Delight’ have leaves that appear purple. Basil grows between 30–130 cm (12–51 in) tall, with opposite, light green, silky leaves 3–11 cm (1.2–4.3 in) long and 1–6 cm (0.39–2.36 in) broad. The flowers are small, white in color and arranged in a terminal spike. Unusual among Lamiaceae, the four stamens and the pistil are not pushed under the upper lip of the corolla, but lie over the inferior lip. After entomophilous pollination, the corolla falls off and four round achenes develop inside the bilabiate calyx. Basil is sensitive to cold, with best growth in hot, dry conditions. It behaves as an annual if there is any chance of a frost. However, due to its popularity, basil is cultivated in many countries around the world. Production areas include countries in the Mediterranean area, those in the temperate zone, and others in subtropical climates. In Northern Europe, Canada, the northern states of the U.S., and the South Island of New Zealand it will grow best if sown under glass in a peat pot, then planted out in late spring/early summer (when there is little chance of a frost). Additionally, it may be sown in soil once chance of frost is past. It fares best in well-drained, sunny exposure. Basil can also be propagated reliably from cuttings with the stems of short cuttings suspended for two weeks or so in water until roots develop. Once a stem produces flowers, foliage production stops on that stem, the stem becomes woody, and essential oil production declines. To prevent this, a basil-grower may pinch off any flower stems before they are fully mature. Because only the blooming stem is so affected, some stems can be pinched for leaf production, while others are left to bloom for decoration or seeds. Once the plant is allowed to flower, it may produce seed pods containing small black seeds, which can be saved and planted the following year. Picking the leaves off the plant helps promote growth, largely because the plant responds by converting pairs of leaflets next to the topmost leaves into new stems. Basil is popularly recommended as a companion plant to the tomato. Common claims are that basil may deter pests or improve tomato flavor. However, in double-blind taste tests, basil did not significantly affect the taste of tomatoes when planted adjacent to them. Basil suffers from several plant pathogens that can ruin the crop and reduce yield. Fusarium wilt is a soil-borne fungal disease that will quickly kill younger basil plants. Seedlings may be killed by Pythium damping off. A common foliar disease of basil is gray mold caused by Botrytis cinerea; it can cause infections post-harvest and is capable of killing the entire plant. Black spot can be seen on basil foliage and is caused by the fungi genus Colletotrichum. More recently, downy mildew of basil caused by Peronospora belbahrii has been a huge problem for commercial producers and home growers. The disease was first reported in Italy in 2004. It was reported in the U.S. in 2007 and 2008 and has been steadily increasing in prevalence, distribution, and economic importance since then. Non-pathogenic bacteria found on basil include Novosphingobium species. including potential toxicity to mosquitos. In folk medicine practices, such as those of Ayurveda or traditional Chinese medicine, basil is thought to have therapeutic properties. There are many rituals and beliefs associated with basil. The French sometimes call basil “l’herbe royale” (“royal herb”), while Jewish folklore suggests it adds strength while fasting. In Portugal, dwarf bush basil is traditionally presented in a pot, together with a poem and a paper carnation, to a sweetheart, on the religious holidays of Saint John and Saint Anthony. However, basil represented hatred in ancient Greece, and European lore sometimes claims that basil is a symbol of Satan. Holy basil, also called tulsi, is highly revered in Hinduism. Basil has religious significance in the Greek Orthodox Church, where it is used to sprinkle holy water. The Bulgarian Orthodox Church, Serbian Orthodox Church, Macedonian Orthodox Church and Romanian Orthodox Church use basil (Bulgarian and Macedonian: босилек; Romanian: busuioc, Serbian: босиљак) to prepare holy water and pots of basil are often placed below church altars. In Europe, basil is placed in the hands of the dead to ensure a safe journey. In India, they place it in the mouth of the dying to ensure they reach God. The ancient Egyptians and ancient Greeks believed it would open the gates of heaven for a person passing on. ^ “British: Basil”. Collins Dictionary. n.d. Archived from the original on 29 November 2014. Retrieved 25 September 2014. ^ “American: Basil”. Collins Dictionary. n.d. Archived from the original on 29 November 2014. Retrieved 25 September 2014. ^ a b c d Simon, James E (23 February 1998). “Basil”. Center for New Crops & Plant Products, Department of Horticulture, Purdue University, West Lafayette, IN. Archived from the original on 2 May 2017. Retrieved 22 January 2018. ^ a b “Basil”. Etymology Online, Douglas Harper. 2018. Archived from the original on 25 October 2012. ^ “Ocimum minimum information from NPGS/GRIN”. ars-grin.gov. Archived from the original on 2015-09-24. ^ “Ocimum africanum Lour. taxonomy detail from NPGS/GRIN”. ars-grin.gov. Archived from the original on 13 September 2016. ^ Fandohan, P.; Gnonlonfin, B; Laleye, A; Gbenou, JD; Darboux, R; Moudachirou, M; et al. (2008). “Toxicity and gastric tolerance of essential oils from Cymbopogon citratus, Ocimum gratissimum and Ocimum basilicum in Wistar rats”. Food and Chemical Toxicology. 46 (7): 2493–2497. doi:10.1016/j.fct.2008.04.006. PMID 18511170. ^ Pessoa, L. M.; Morais, SM; Bevilaqua, CM; Luciano, JH (2002). “Anthelmintic activity of essential oil of Ocimum gratissimum Linn. and eugenol against Haemonchus contortus“. Veterinary Parasitology. 109 (1–2): 59–63. doi:10.1016/S0304-4017(02)00253-4. PMID 12383625. ^ a b Johnson, B. Christopher; et al. (1999). “Substantial UV-B-mediated induction of essential oils in sweet basil (Ocimum basilicum L.)”. Phytochemistry. 51 (4): 507–510. doi:10.1016/S0031-9422(98)00767-5. ^ Baritaux, O.; Richard, H.; Touche, J.; Derbesy, M.; et al. (1992). “Effects of drying and storage of herbs and spices on the essential oil. Part I. Basil, Ocimum basilicum L.”. Flavour and Fragrance Journal. 7 (5): 267–271. doi:10.1002/ffj.2730070507. ^ a b Miele, Mariangela; Dondero, R; Ciarallo, G; Mazzei, M; et al. (2001). “Methyleugenol in Ocimum basilicum L. Cv. ‘Genovese Gigante‘“. Journal of Agricultural and Food Chemistry. 49 (1): 517–521. doi:10.1021/jf000865w. PMID 11170620. ^ Hiltunen, Raimo; Holm, Yvonne (2 September 2003). Basil: The Genus Ocimum. CRC Press. ISBN 9780203303771. Archived from the original on 18 April 2017. ^ Bomford, Michael (May 2009). “Do Tomatoes Love Basil but Hate Brussels Sprouts? Competition and Land-Use Efficiency of Popularly Recommended and Discouraged Crop Mixtures in Biointensive Agriculture Systems”. Journal of Sustainable Agriculture. 33 (4): 396–417. doi:10.1080/10440040902835001. Archived from the original on 18 September 2016. Retrieved 17 September 2016. ^ Roberts, P.D., Raid, R.N., Harmon, P.F., Jordan, S.A., Palmateer, A.J., 2009. First Report of Downy Mildew Caused by a Peronospora sp. on Basil in Florida and the United States. Plant Disease 93, 199–199. ^ Wick, R.L., Brazee, N.J., 2009. First Report of Downy Mildew Caused by a Peronospora Species on Sweet Basil (Ocimum basilicum) in Massachusetts. Plant Disease 93, 318–318. ^ a b Maurya, Prejwltta; Sharma, Preeti; Mohan, Lalit; Batabyal, Lata; Srivastava, C.N. ; et al. (2009). “Evaluation of the toxicity of different phytoextracts of Ocimum basilicum against Anopheles stephensi and Culex quinquefasciatus”. Journal of Asia-Pacific Entomology. 12 (2): 113–115. doi:10.1016/j.aspen.2009.02.004. ^ Hiltunen R, Holm Y (2003). Basil: The Genus Ocimum. CRC Press. pp. 120–1. ISBN 9780203303771. Archived from the original on 12 October 2016. ^ Ambrose, Dawn C. P.; Manickavasagan, Annamalai; Naik, Ravindra (25 July 2016). Leafy Medicinal Herbs: Botany, Chemistry, Postharvest Technology and Uses. CABI. ISBN 9781780645599. Archived from the original on 21 April 2017. ^ “Blessing of the Waters known as Agiasmos conducted by a Greek Orthodox priest”. Archived from the original on 7 March 2012. Retrieved 10 September 2012. ^ Mercia MacDermott (1998). Bulgarian Folk Customs. Jessica Kingsley Publishers. pp. 114–. ISBN 978-1-85302-485-6. Archived from the original on 12 October 2013. Retrieved 2 August 2013. ^ Amy Felder, CEPC (7 March 2007). Savory Sweets: From Ingredients to Plated Desserts. John Wiley & Sons. pp. 92–. ISBN 978-0-470-07968-3. Archived from the original on 12 October 2013. Retrieved 2 August 2013. ^ Lucy Bregman (2010). Religion, Death, and Dying. ABC-CLIO. pp. 136–. ISBN 978-0-313-35180-8. Archived from the original on 12 October 2013. Retrieved 2 August 2013. A basil-like tulsi leaf, which is considered to be a holy plant, may be placed in the mouth as well. ^ Robin Nelson-Shellenbarger (25 February 2013). Family Herbal Wellness. Booktango. pp. 38–. ISBN 978-1-4689-2481-7. Archived from the original on 12 October 2013. Retrieved 2 August 2013. ^ Copetta, Andrea; Lingua, G; Berta, G; et al. (2006). “Effects of three AM fungi on growth, distribution of glandular hairs, and essential oil production in Ocimum basilicum L. var. Genovese“. Mycorrhiza. 16 (7): 485–494. doi:10.1007/s00572-006-0065-6. PMID 16896796. “Three arbuscular mycorrhizal fungi differently affect growth, distribution of glandular trichomes and essential oil composition in Ocimum basilicum var. genovese“. Archived from the original on 1 June 2009. Retrieved 3 July 2009.